The turmoil in Israel after the Yom Kippur War led to the election of Menachem Begin and the historical peace agreement with Anwar Sadat. But was it peace? The Yom Kippur War was the darkest time since the Holocaust for the Jewish people. 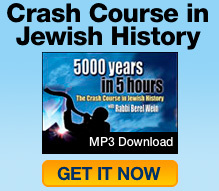 But ultimately it came to emphasize the miraculous nature of Jewish survival. The 6 Day War in 1967 was a major turning point. On the verge of annihilation, Israel emerged victorious and regained Judaism's holiest site, the Western Wall. As Nasser rose to power in Egypt and unleashed terrorists attacks, Israel mounted the Sinai Campaign. Military victory turned into diplomatic defeat, however. Israel had to absorb more than a million immigrants in its first years. It faced enormous housing, economic, political, cultural and military problems. World guilt over the Holocaust opened a brief window of opportunity which, along with some obvious divine intervention, launched the Jewish state. The Holocaust is the most difficult topic in Jewish history. Its scope is beyond human understanding. However,its impact on Jewish life can't be ignored. The Second World War unleashed forces undreamed of in their potential and terror. If a war could be called just, it was the Allied efforts against Hitler. Jewish life today in the US is very different than before 1948. Forces like poverty, bigotry and the Melting Pot caused Jews to drop tradition and assimilate. The rise and fall of Adolf Hitler is one of the most terrible, dramatic and unbelievable stories in history. Jewish life between WWI and WWII was in turmoil. Anti-Semitism and assimilation decimated Jewish numbers and morale. It was a harbinger of what was to follow. The wave of immigration known as the Third Aliyah was fueled by idealism. But the reality that confronted them would shake their dreams to the foundation. Although the Balfour Declaration was written into the British Mandate and ratified by the League of Nations the British tried to stifle the Zionist dream. Rather than solve Europe's problems the Versailles Treaty perpetuated them. However, one provision had a profound impact on Jewish history, the British Mandate. WWI uprooted Jewish communities and destroyed the infrastructure of Jewish life, forever changing the face of Jewry. But an event at the end gave Jews hope. In decade before WWI Eastern European Jewry was disintegrating externally and internally due to urbanization, revolution and virulently anti-religious Jews. As Herzl tried to hold his Zionist movement together contentious battles were fought over questions like: Will it be a Jewish state? What type of Jewish state? At the dawn of the 1900s, the horrific Kishinev pogrom and the Beilus trial dashed Jewish hopes of a future and made them socialists, Zionists or pessimists. The First Aliyah, Jewish settlers to the Holy Land from 1881-1901, were secular, idealist and extremely naïve about Arab reaction to their arrival. In 1897, Theodore Herzl declared at the First Zionist Congress, “Today, I have founded the Jewish state. It will take you 50 years to see it.” It was visionary. A new type of anti-Semitism arose in the 1800s - one based on race, not religion. The culmination of this new anti-Semitism was the infamous Dreyfus Affair. Between 1882 and WWI, despite great obstacles, Jews immigrated in droves to America, the New World, changing not only Jewish life but America as well. The modern day return of the Jewish people to the Land of Israel began over 150 years ago with a strange mix of rabbis and atheists called the Lovers of Zion. The Mussar Movement met opposition from within and without after the death of its founder, Rabbi Israel Salanter, but spread wider because of it. The Mussar Movement combined with the Yeshiva Movement held together the Jewish people from being swept away by the tide of Haskalah and assimilation. Rabbi Moses Sofer started the first yeshiva in the Austro-Hungarian Empire. It differed from yeshivas in Poland, but turned back the tide of assimilation. The Yeshiva movement 200 years ago was revolutionary in its time, and the main defense against Haskalah, guaranteeing the furtherance of traditional Judaism. In the 19th century in Russia there occurred a drastic change in Jewish life whose ripple effects are still felt today. For the first time in perhaps seven or eight centuries Jews orchestrated a direct confrontation with traditional Judaism. In the 1800s, the Czar of Russia dealt with his “Jewish problem” in three ways: conversion, emigration and destruction. Through a series of harsh decrees Jews would convert to Russian Orthodoxy, emigrate out of Russia or face destruction. Jews in Russia in the 1800s faced a series of anti-Semitic decrees by the Czars that sought to destroy them. The reverberations of these decrees are felt today. Napoleon profoundly influenced not only the world generally, but the Jewish world as well, even attempting to revive the Great Sanhedrin. The Vilna Gaon was a once-in-a-thousand years genius who spent his days in secluded study, yet had the most profound impact on the world, including ours today. Chassidus spread through Eastern Europe but only through a surprising counter revolution within the movement that eventually made it the establishment. The spiritual vacuum created by false messiahs, poverty and persecution in Eastern Europe was filled by the Chassidic Movement, founded by the Baal Shem Tov. As the French Revolution raged, Jews in Western Europe created Reform Judaism, which provided a greased slide into assimilation and Christian European society. Enlightenment ideals brought great upheaval to world Jewry. Frederick the Great, Amschel Mayer Rothschild and Moses Mendelssohn define the era and the upheaval. In the struggle to uproot vestiges of Sabbatai Zevi, Rabbis Jacob Emden and Jonathan Eybeschutz engaged in a bitter controversy that undermined world Jewry. The years 1648 and 1649 (Tach V’tat) were supposed to be messianic. Instead, they turned into a catastrophe on par with the Holocaust in many ways. The 17th century marks the rise of mercantilism. Jews were active in it on many levels. At the same time, Jews like Spinoza were challenging it internally. In the 1600s, Jewish mysticism became widespread, but was countered by Renaissance skepticism. This laid the ground for the calamitous events of the 1700s. The Protestant Reformation changed forever the face of Western civilization, and in so doing changed world Jewry, shifting its center to Eastern Europe. Among the Jews who left Spain during the expulsion in 1492 was a boy not even 13 who would become one of the great figures in the history of the Jewish people, Rabbi Joseph Caro (sometimes spelled Karo). By the time of his death in approximately 1575 it could be said that from the time of Maimonides until his time no person had a greater and longer lasting influence on the Jewish people. He was not only the giant of his age, and all the ages since. Jewish life in Poland remained vibrant for 500 years. Though filled with extreme hardship, it had a spiritual richness that helped Jews transcend the mundane. The Marranos suffered greatly, but some managed to flee Spain, finding tolerance and success with other Jews in lands such as Italy, Turkey, Israel and Holland. The Renaissance brought a new intellectual spirit to Europe but also challenged the power of the Church. For the Jews, it opened new possibilities and dangers. Don Isaac Abarbanel almost prevented the expulsion of the Jews from Spain, but could not. The end of Spanish Jewry was a blow unequaled until the Holocaust. Although the Black Death devastated all Europe, for the Jews it is was compounded by Christian persecution that blamed them for the disaster. During the 1200s, persecutions pushed Ashkenazic-European Jewry to the precipice of physical and spiritual extinction. But three men turned everything around. Between blood libels, pogroms, the burning of the Talmud and expulsions from England and France in the 13th century, it is a miracle the Jewish people survived. Even as the situation of the Jews in Christian Europe rapidly deteriorated, one sage put his stamp on Jewry for all time: Rabbeinu Tam, the grandson of Rashi. For 900 years, no Jew studies Torah or Talmud without Rashi. He is the guiding hand and gentle teacher who explains the words and inspires all who study Torah. The Jews fulfilled three roles in Europe: money-lender, scapegoat and harbinger of new ideas. All three made him necessary as it made his life precarious. Jews faced increasingly harsher persecutions Christian dominated Spain, including accusations from usury, desecrating the host, blood libels and well poisoning. Nachmanides is one of the greatest Jewish scholars ever. His resounding victory in a with the Church marked a turning point in Jewish-Christian relations. Solomon ibn Gabirol, Judah Halevi and Abraham ibn Ezra were three of the greatest Jews of the Golden Age. Their lives give us a personalized glimpse of the era. The Golden Age of Spanish Jewry, despite eruptions of Islamic fanaticism, was marked by expansion of Jewish wealth and influence in politics and philosophy. There were three major reasons that the center of Jewish life shifted from Babylon to Spain starting around the year 1000 CE: division, migration and assimilation. The spread of the Jews from Babylon to North Africa and Europe is remarkable and based on the legend of four great rabbis who were kidnapped by Arab pirates. Despite his turbulent life, Rabbi Saadiah Gaon's clear insight and influence of knowledge have remained part and parcel of the Jewish people until today. As the Jews settled into life under the Muslims, dealing with its good and bad influences, the heretical Karaite movement threatened both Jews and Judaism. In less than a century, Islam swept through the Arabian Peninsula. Even as the Muslims became the new leaders of civilization, Jewish reaction was ambivalent. As Europe entered the Dark Ages, and the Church formulated anti-Semitic doctrines, the Jews completed the Talmud and preserved Judaism for future generations. Rabbi Akiva arguably represents a combination of everything that is heroic about the Jewish people more than anyone else. At the least, he is one of the most beloved figures in Jewish history, a person whose influence and stature is a source of inspiration throughout all of the ages. The rise of Christianity occurred during the extremely tumultuous period we have been studying, the Herodian Era. It was Hillel, not Herod, who reestablished the true Kingdom of the Jews, which is the Kingdom of Torah, nobility of character, patience, goodness and kindness. Herod may have been a great murderer, but he was a great builder. And he was not a person given over to modesty or one who did things on a small scale. Whatever he did was larger than life. Herod was a certified madman, but had moments of genuine concern for the country. In the end, though, his legacy was one of paranoia, terror, murder and evil. The Hasmonean Era was one of the most glorious and tragic in Jewish history – as well as for understanding Jewish history and destiny. The decline of the Hasmoneans coincided with the rise of Rome, but it wasn't coincidence, for the once great Jewish family had become a shell of its holy roots. Chanukah was a miraculous military victory, but a tiny cruse of oil proved more miraculous and enduring in the memory of the Jewish people. Greek culture slowly infiltrated Jewish culture, threatening to destroy the Jewish people in ways tyrants could not do through brute force. The story of Alexander the Great and the Jews is intimately intertwined. However, its after-effects shook the Jewish world to its roots. Greek culture would tempt Jews like no other, threatening to destroy Judaism. It would be as much an exile of mind as of the body. The Men of the Great Assembly passed decrees that ensured the Jewish peoples’ survival in the post-Temple era down to our times. Was the Persian king Cyrus who permitted the Jews to return to their land and rebuild their Temple Jewish? This is just one of the questions and intrigues surrounding the beginning of Jewish history in the Second Commonwealth. The Persian exile began positively for the Jewish people, but turned dark with the threat of holocaust at the hands of one of history’s great anti-Semites. The Babylonian exile set into motion patterns of Jewish history that have held true throughout the ages down to our time in uncanny ways. The success of the Jews in Babylon is all the more remarkable when seen in the context of the terror that was Babylonian society and its tyrannical leader. After the destruction there was hope that the survivors would rally around a new leader, Gedaliah, but instead it was another tragic chapter in Jewish history. The destruction of the First Temple was devastating, but the Jewish people took the lessons to heart and solidified their identity as an Eternal People. The last king of Judea was caught in the vice of almost irresistible forces unleashed by earlier generations, but gained a measure of redemption before he died. Judea deteriorated badly after Josiah died, but a tiny seed planted in Babylon would take root and serve as a symbol of Jewish rejuvenation for all posterity. The prophet Jeremiah witnessed the destruction of the Temple and suffering of his people, yet penned some of the most beautiful lines of hope ever written. Aided by the prophet Isaiah, Hezekiah led his nation so faithfully through Armageddon-like times that he almost became the Messiah, save for one character flaw. After civil war split the Jewish people, Judea was a small, defenseless country, but it outlived its counterpart because of its adherence to its spiritual calling. After generations of spiritual decline, the dramatic fall of the Ten Tribes was shocking. Known now as the "Lost Tribes" the question is: Will they ever return? Elijah was one of the most influential prophets even though his words fell on the deaf ears of the wayward northern kingdom and its wicked king Ahab. More than mere fortune tellers, the prophets were the moral conscience of the people, and as such, often found themselves in mortal danger from those in power. After King Solomon’s death, the Jewish kingdom was torn apart by civil war that permanently changed the landscape of the Jewish world. Solomon was an immensely complex and layered personality. The wisest of men was truly pious and noble, yet torn apart by self-destructive tendencies. King David, forerunner of the Messiah, was misunderstood by many of his contemporaries. In that way his life epitomizes that of his people, the Jews. There is no more tragic figure than Saul, first king of Israel. He was good, heroic and modest – yet was destroyed by the crown he never wanted to begin with. Samuel was judge, prophet, warrior and educator. He led the people during a time of great turmoil and gave them hope for the future. The Era of the Judges was characterized by a steep decline, but included great moments and memorable heroes and heroines. Joshua conquered the land and then transitioned the nation to a confederacy, but his achievements were beset by self-doubt and conflict. The 40 years in the desert was both harsh and necessary for the Jewish people to become who they would be. The grandeur and challenges of living up to the greatest event in human history. Judaism is uniquely universal and particular – and establishes this pattern in the Book of Genesis, as Rabbi Wein explains in this panoramic overview. Jacob’s twelve sons, like the Jewish people, were a cantankerous group. Jacob sought to harness their individualism and make them one nation. The story of Joseph’s sale into slavery, rise to prominence and reconciliation with his brothers is one of the most dramatic in world literature. Beyond the facts is a deep message about the human condition. The ten generations between Noah and Abraham saw the birth of technology. It also saw the rise of the tyrant Nimrod, the antithesis of Abraham and morality.